I am expecting many changes to dividends paid by BDCs in 2019, including increases, decreases, and special/supplemental dividends. The previous articles in this series have accurately predicted many of the recent changes to dividends including ARCC, MAIN, TCRD, and TSLX. BDCs will begin reporting Q1 2019 results later this month and this article discusses some of the items that investors can expect for GAIN including its regular dividend. As mentioned in recent articles, there are a handful of Business Development Companies ("BDCs") that will likely cut dividends in 2019, including THL Credit (TCRD) as predicted in "Dividend Cuts For The High-Yield BDC Sector" and Medley Capital (MCC), which announced that it was reducing its quarterly dividend by 50% (also predicted in previous articles). However, there are also many more that will likely increase their current regular dividend and/or pay special dividends this year. Historical dividend coverage: Using adjusted earnings (exclude certain one-time expenses) taking into account recurring vs. one-time revenues, cash vs. PIK interest income, etc. Projected dividend coverage: Using best-, base-, and worst-case scenarios taking into account potential credit issues, portfolio growth/decline, changes to portfolio yield, various amounts of non-recurring income from dividends and fees, changes to borrowing and operational expenses. Optimal Leverage Analysis: Assessing future dividend coverage based on portfolio growth using available cash and borrowings (leverage) as well as changes in portfolio yield, apples-to-apples comparison of BDC dividend coverage using similar amounts of leverage. Part 2: Correctly predicted an increase in the amount of dividends paid in 2019 for Ares Capital (ARCC). Part 3: Correctly predicted increased special dividends for TPG Specialty Lending (TSLX). Part 4: Discussed continued increases in the monthly dividend for Main Street Capital (MAIN). Many Seeking Alpha articles (and investors) focus on historical dividend coverage for assessing potential dividend coverage. However, when it comes to weighing the previously mentioned categories of dividend coverage, historical is typically the least reliable indicator for future coverage. There are many reasons for this, including constantly changing income and expense trends as well as portfolio credit issues. Many of the BDCs that have previously cut dividends announced that the primary drivers of the reduced distributions were related to potentially lower yields on investments either due to yield compression, rotating into safer investments and/or recent portfolio credit issues. 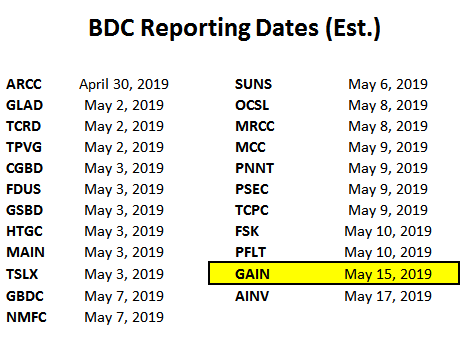 Most of these BDCs had "spillover" or excess distributable income and gains that could have been used to cover shortfalls, but management decided to align the dividends with projected earnings. For the quarter ended December 31, 2018, GAIN beat my best case projections due to lower 'Other G&A', no income incentive fees paid during the quarter and higher-than-expected 'other income'. As shown below, 'Other G&A' (net of credits) is inconsistent and has a meaningful impact on dividend coverage. The quarter over quarter decrease in G&A was partially due to $1.1 million of bad debt expense from placing SOG Specialty Knives & Tools ("SOG") on non-accrual during the previous quarter. As predicted, there were significant realized gains ($76.8 million or $2.34 per share) mostly due to the sale of its equity interest in Cambridge Sound Management, Inc. However, in January 2019, GAIN restructured its non-accrual loans to SOG and realized a loss of $10.0 million but will not impact net asset value ("NAV") per share in calendar Q1 2019. So as of this quarter end for our balance sheet undistributed or over-distributed income and net realized gains totaled almost $77 million or $2.34 per common share. When removing the $20 million of cap gains-based incentive fee accrual the amounts would be roughly $97 million or almost $3 per common share. This is the amount that would be available for distribution to shareholders in future periods. Sources: SEC Filings and www.bdcbuzz.com. The amount of preferred and common equity still accounts for over 33% of the portfolio fair value which need to be partially monetized and reinvested into income producing secured debt. Projecting dividend coverage is mostly about reading the trends for income and expenses. This includes general sector and specific company trends, watching and predicting portfolio credit issues, changes to capital structure and borrowing costs as well as estimating a range of performance for portfolio growth and non-recurring income. Many BDCs have recently been experiencing higher portfolio yields due to the impact of rising LIBOR on variable-rate investments. Previously, the BDC sector experienced declining portfolio yields driven by competition for "true" first-lien and higher-quality assets. 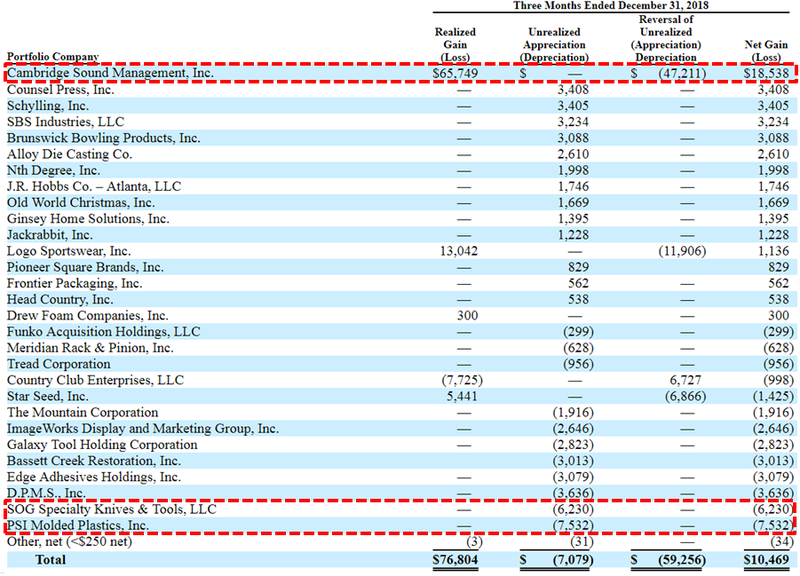 As shown in the Leverage Analysis (discussed later) and the following table, the company will likely earn at least $0.219 per share each quarter covering 108% of the current dividend which is basically 'math' driven by an annual hurdle rate of 7% on equity before paying management incentive fees. I am expecting continued dividend growth and/or semiannual dividends due to the continued growth of undistributed income and net realized gains after excluding capital gains incentive fee accruals. Secondly, with the significant equity positions that we own in each portfolio company, we do look for increasing value so that an increase in the equity provides cap gains and other income over the life of the investment or upon the exit. With these potential capital gains and other income made and we distributed to our stockholders in part as supplemental distributions. So as our portfolio matures, we should continue to realize gains from exits somewhat consistently. We've made four such planned supplemental distributions in the amount of $0.06 per share to common stockholders in June and December 2017, and again in June and December 2018. This is a longer-term run-rate analysis of dividend coverage that takes into account the potential for portfolio growth with available capital (excluding equity offerings). I typically use stable and higher/lower portfolio yields with minimal amounts of non-recurring income to project dividend coverage with a fully ramped portfolio using "optimal leverage." 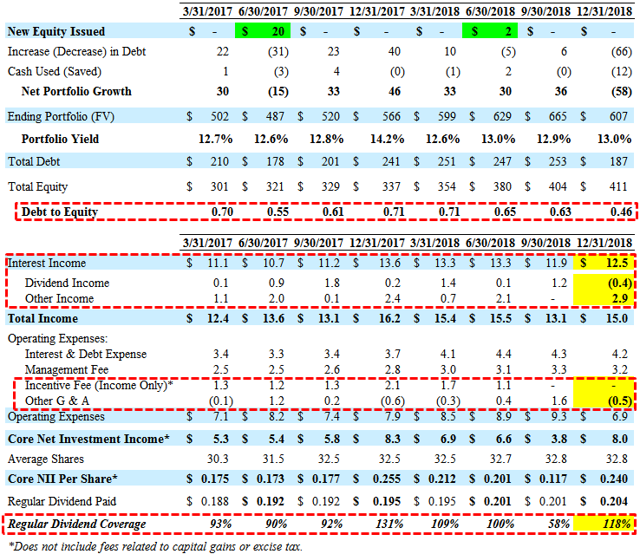 "Prospect Capital: Expected Dividend Cut Of 20% To 30%" mentioned "the current dividend is not sustainable and that it needs to be reduced by at least 20% but more likely by 28%, which would be $0.06 per month and closer to the $0.18 quarterly NII shown in the 'Lower Yield' scenario." "Oaktree Management Fees Driving Upcoming Dividend Cuts" mentioned "the reduced income and hurdle rate will result in much lower than expected NII in the coming quarters, and the quarterly dividend will be cut to $0.10 or even $0.08"
Previously, GAIN's Board approved the modified asset coverage ratio from 200% to 150%, effective April 10, 2019. However, the company is subject to a minimum asset coverage requirement of 200% with respect to its Series D Term Preferred Stock. Historically, the company has maintained its leverage over the last two years with a debt-to-equity ratio between 0.60 and 0.70 but is currently 0.46 giving the company plenty of growth capacity. Q. Can you guys refresh us if you have any sort of target range and if that's changed at all given some of the changes we're seeing in the BDC industry regarding leverage? A. Nothing has really changed in our approach to leverage as it has for. If you recall our Board did approve our "Asset Coverage" to be reduced from 200% to 150%, which would go into effect this April. But as you noted, pay downs has been significant, so we're nowhere close to those metrics. On August 22, 2018, GAIN announced the closing of its offering of 3 million shares of 6.375% Series E Cumulative Term Preferred Stock due 2025, resulting in net proceeds of approximately $72.1 million. The company is required to maintain an asset coverage ratio of 150% effective April 10, 2019. GAIN used the proceeds, plus borrowings under its credit facility, to redeem all outstanding shares of its 6.75% Series B Cumulative Term Preferred Stock and its 6.50% Series C Term Preferred Stock. On August 23, 2018, GAIN announced the amendment and extension of its credit facility including an increase in facility size, extension of the maturity date, and a reduction in pricing. 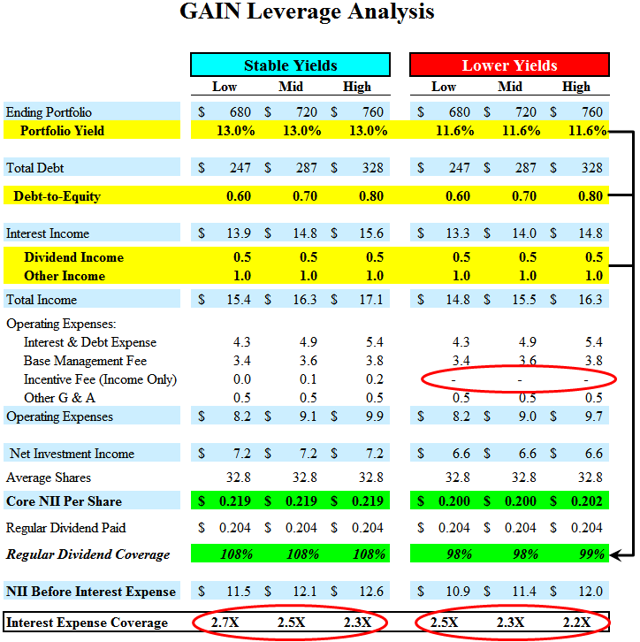 The following table shows six different scenarios with various amounts of leverage, using the current portfolio yield of 13.0% and a lower yield of 11.6% to determine the impacts on dividend coverage. Each of these scenarios assumes a full quarter of benefit from interest income but also a full quarter of interest expense, management and incentive fees. It is important to note that this analysis is dependent on average dividend and other income of $1.5 million. Higher and lower amounts will have a meaningful impact on potential dividend coverage. During calendar Q4 2018, NAV per share increased by another 1.9% (from $12.30 to $12.53) mostly due to net realized gains from the sale of its equity interest and the prepayment of its debt investment in Cambridge Sound Management, Inc. ("Cambridge") to Biamp Systems as discussed in the previous report. These gains were partially offset by markdowns for PSI Molded Plastics ("PSI") and SOG Specialty Knives & Tools ("SOG") as shown in the following table. The continuing increase in NAV really resulted in part from the improvement and the growth in the equity values of our buyout portfolio companies along with some successfully completed exits at very significant realized gains. Q. 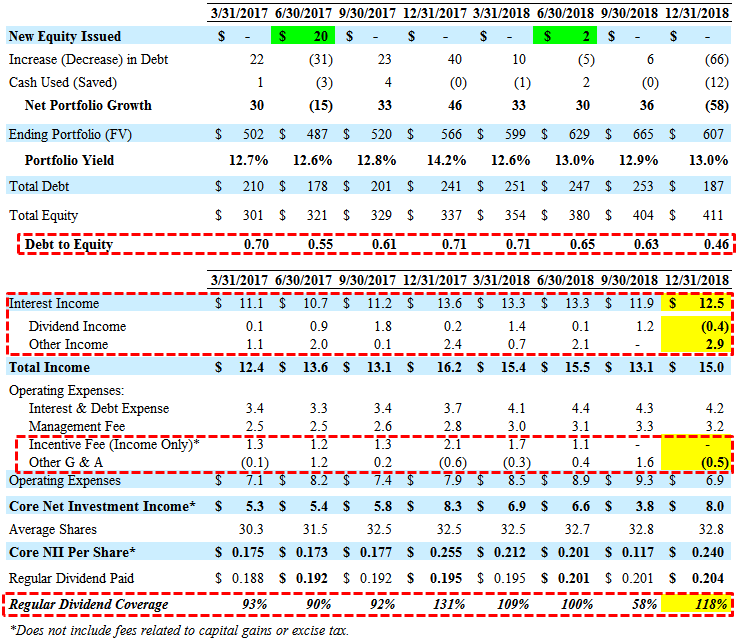 Wanted to ask you also about PSI, I think in the last earnings call you were somewhat optimistic about the outlook for the company, but you markdown the debt this quarter fairly meaningfully which would imply there is still problems. Can you qualitatively give us an update on the company? A. It actually that started out this year pretty well. I think - I'm still optimistic about the business it's still overall a pretty good size business with very significant EBITDA. The valuations obviously is a result of overall call it decline in EBITDA just because of some - issues internally we've had to manage with the business. So yes we decided and it made sense just given valuations where we were to do what we did, but I feel pretty good about the business fundamentally. And some of the things we have been working on over the last say quarter in terms of management issues et cetera. And so again short answer I feel pretty decent about it at this point. Also, SOG was marked down by another $6.1 million and The Mountain was marked down by another $1.9 million and is now at 8% of cost. Total non-accruals now have a cost basis of $73.5 million, or 12.2% of the portfolio at cost, and fair value of $30.4 million, or 5.0% of the fair value of the portfolio. It should be noted that the equity positions in all of these companies have been marked down to zero fair value. We continue to have four loans that are on nonaccrual and they represent about 7.5% of the fair value of our total debt investments and we continue to work with those companies to improve operating performance, liquidity and value. Subsequent to 12/31/18, we did restructure two of our investments in SOG and we did realize a loss of about $10 million. Now, this was a conscientious action on our part allowing us to take advantage of some tax planning frankly and to preserve shareholder value in SOG, and we really do anticipate a recovery. And again it's one of those where we had to take action, we are taking action and the Company fundamentally is in a good position, we have to be a little patient. Q. And in terms of SOG you restructured it I guess last month, wasn't clear though whether that will be put back on accrual or is that still going to take some time? A. Actually I would say that will take some time. Again, it's one where we got good fundamentals for variety of reasons we'll get into here. We've made changes done some things that we think are right and I think we know just have to again be patient with that one looking forward, but it's not going to happen overnight. GAIN has consistently raised regular monthly distributions to shareholders, having never missed a monthly distribution since its IPO in 2005. The regular distribution was increased to $0.82/share annual run‐rate in October 2018. In addition to regular distributions, GAIN also seeks to pay supplemental distributions to shareholders, consisting of realized capital gains from portfolio company exits and other income. In December 2018, paid a $0.06 supplemental distribution. I am expecting an increase in the regular monthly dividend in 2019 due to the continued increases in NAV per share and realized gains, reduced non-accruals and the potential for improved coverage through portfolio growth and rotating out of equity investments. Our Board will look at the payments of supplemental distributions for the calendar 2019 at the regular Board meeting in April. The team is trying hard to increase the payouts. Please note there's no guarantee that the regular or even the supplementals will be paid, but that is the central role of this Company. From inception in '05 through 12/31/18 we've exited 16 buyout companies. And these exits have generated over $185 million in net realized capital gains and at about $22.8 million at other income on the exits. BDCs will begin reporting Q1 2019 results later this month starting with ARCC and investors should be closely monitoring dividend coverage potential and portfolio credit quality. Disclosure: I am/we are long GAIN. I wrote this article myself, and it expresses my own opinions. I am not receiving compensation for it (other than from Seeking Alpha). I have no business relationship with any company whose stock is mentioned in this article.